"An extra-easy wonderfully refreshing cream cheese and mixed fruit pie. Perfect for picnics, hot summer nights, or even breakfast!" Roll pastry into an 11 inch circle. Lay flat on a baking sheet or pizza pan. Prick several times with a fork. Bake in preheated oven for 12 to 15 minutes, until light brown. Remove and allow to cool completely. In a small mixing bowl, beat together cream cheese and sugar until mixture is creamy and smooth. Spread evenly onto cooled pastry. 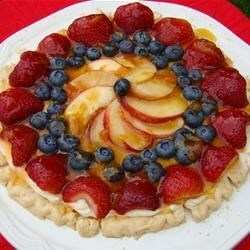 Arrange fruit in a decorative pattern over cream cheese layer. Chill until ready to serve. Very tasty. I found that the filling barely filled up the pie crust, I plan to double it next time. I will definitely make it again!